Dubai Shopping Mall witnessed the launch of MARLI New York’s first store in the country. With a promise to present an entirely new experience to its guests, MARLI New York; with its exclusive architectural design, reflects the store’s commitment to introduce authentic styles and designs for ladies to express their unique personalities. The famous brand-name presents, through their store in Dubai, new concepts through their trendy New-York-women inspired designs aiming to reflect their fashion and dynamic lives. Guests entering the store in Dubai are led to a double-height atrium where they are greeted by a luxurious brass logo and Arabescato marble walls embroidered with attractive brass frames. 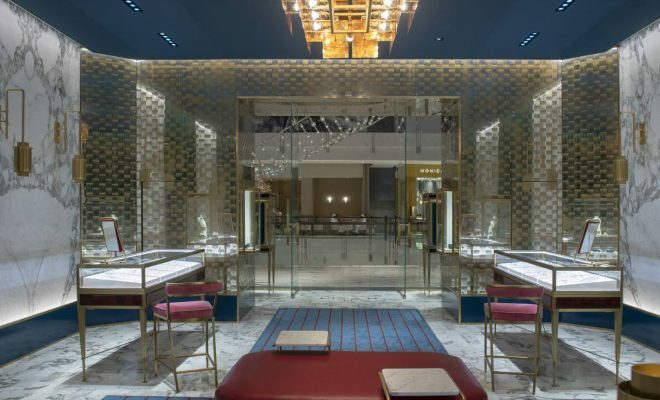 Centered in the entrance of the store is an arch decorated with gold-framed mirrors with exhibitions of the MARLI Collection and unique luxurious jewelry pieces set to each side especially for those passionate about luxury and extravagance. The MARLI Collection is featured in a series of stand-alone copper and glass displays, each with a lavish seating. At the back of the store, guests enjoy a more private experience with a personal assistant assigned for each of the guests. The design of the MARLI New York’s luxurious design would go unfinished without the glamorous lighting shed by the brass luster of the majestic chandelier set in the center. To top it off, the place is completed with copper and crystal wall lights, as well as the directional light that accentuate the intricate details of the place. MARLI New York is a fine jewelry brand from New York, launched by Maral Artinian with an emphasis on authenticity, individuality and an existential timelessness. Their pieces are known for being 18-carat gold handcrafted pieces embellished with diamonds and a set of exquisite gems reflecting of their commitment for presenting high-end luxury products. 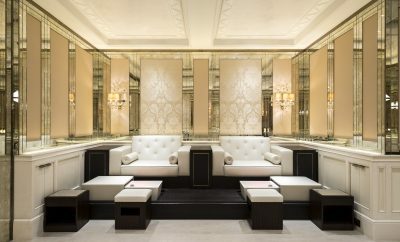 The Lanesborough Club & Spa – A home away from home in the heart of London.